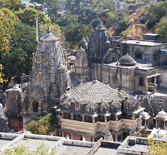 "Creating benchmarks in heritage tourism as ascribed by Maharana Bhagwat Singhji"
The religious Trusts are responsible for the maintenance and functioning of more than 30 historic temples around Udaipur. These Trusts promote activities associated with religious tourism. MMCF and LPHM Pvt. Ltd are responsible running of the City Palace Museum, Crystal Gallery, Flora Danica Collection and The Vintage & Classic Car Collection. These are some of the most visited museums of Udaipur. HRH Pvt. Ltd. has some of world that are known to host several celebrity the most unique heritage wedding venues in the parties and weddings every year. Organisation: HRH Pvt. Ltd. and LPHM Pvt. Ltd.
Shiv Niwas Palace, Fateh Prakash Palace and Jagmandir Island Palace at Udaipur, Gajner Palace, Gajner (near Bikaner) are heritage hotels nonpareil with their exquisite setting. They have been awarded as best heritage hotels by the Ministry of Tourism, a number of times. 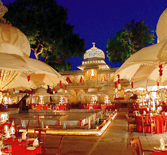 The Royal Retreats include the Garden Hotel and Shikarbadi in Udaipur, Aodhi at Kumbhagarh, Fateh Bagh at Ranakpur, Gorbandh at Jaisalmer and Karni Bhawan at Bikaner. Organisation: HRH Pvt. Ltd., LPHM Pvt. Ltd., Shikarbadi Hotel Pvt. Ltd. and Rajput Hotel and Resorts Pvt. Ltd. The Ministry of Tourism, Government of India; The Department of Tourism, Government of Rajasthan and the Federation of Indian Chambers of Commerce and Industry (FICCI), New Delhi organised The Great Indian Travel Bazaar 2008 -an international tourism mart in April 2008 at B.M. Birla International Convention Centre, Jaipur. The purpose of Travel Bazaar was to highlight India as a world-class tourism destination with its myriad attractions. HRH Group of Hotels taking the lead in initiatives, which support the industry and Rajasthan at a global level hosted the Conference for the same in December 2007 at The Durbar Hall, Fateh Prakash Palace, Udaipur. This early association further triggered the way for HRH becoming an obvious choice for Platinum Sponsor of the mart in April 2008. 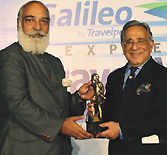 The sixth edition of the annual Galileo Express travel World Awards was organised by The Express Group on 10th December 2008 at The Grand, New Delhi. The event was dedicated to the employees of the Taj Mahal Palace and Tower and the Oberoi Trident, Mumbai who risked their lives during the massacre in Mumbai in November demonstrating self sacrifice and the true ethos of hospitality. The awards are a culmination of excellence in the travel, tourism and hospitality industry in India. 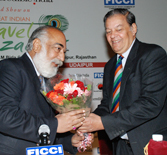 Shriji Arvind Singh Mewar of Udaipur was honoured with the Lifetime Achievement Award. Infrastructure development efforts are on for firmly establishing of religious tourist circuit and plans to develop cultural knowledge centres at identified locations for all tourists.